La fenêtre d'artisanat bénéficie de plusieurs améliorations, comme des options pour ouvrir ou fermer toutes les catégories, ou encore une option pour ne pas afficher les recettes qui ne correspondent pas à votre niveau. Le nombre d'emplacements d'objets de quêtes dans l'inventaire passe de 20 à 40. La prévisualisation d'équipement ou de tenue est plus complet comme celui de la boutique, permettant de visualiser un ensemble ou bien une partie. Le nombre de tenues passe de 20 à 39 + l'équipement porté. Plus d'options de couleur pour les joueurs daltoniens. Le pack des 4 nouvelles âmes coutera 4500 crédits pour un abonné et 5000 crédits pour un non-abonné, soit l'équivalent de 4 REX que nous pourront acheter avec les platines du jeu ou en dépensant 25 euros. c'est officiel Andvar, ça a été écrit par Daglar lui-même sur le fofo US. La mise à jour est reportée sans date précise. Bon déjà la moitié du matos manque. Ce qui encore passerait, en étant équipé P1 et avec les quelques pièces dispo, j'arrive à un honorable 56k. Le soucis est qu'à nouveau la traductions français à pas été faite. La moitié des compétences à pas de nom, voir pas de tooltip. . . Donc macro impossible et allez vous souvenir quel cd fait quoi quand vous avez pas les noms. . .
J'attendais la 2.7 avec impatience, là ça me tue carrément ma joie. ce n'est pas la 2.7 (car comme je l'ai dit plus haut: elle est reportée) mais juste la livraison des nouvelles âmes..
il va falloir encore patienter un peu..
Seulement le portage sur les versions français et allemande on encore été fait avec les pieds. Effectivement il manque quelques traductions des nouvelles compétences, surtout dans les racines des arbres. La mise à jour ayant été reportée jusqu'au dernier moment pour des raisons techniques je pense que la traduction n'a pas été la priorité, sachant que c'est un peu leur point faible. Entre pas nous la donner et nous la donner pas traduite je pense qu'ils ont choisi ce qui nous plairait le plus, un peu de patience! Available at the RIFT Store, these souls will allow Warriors and Rogues to heal, Mages to tank, and Clerics new avenues of support! Whether you want to play Oracle or Arbiter, Liberator or Physician, these new souls allow an almost infinite number of new build possibilities! More Tier 3 raids, the Blighted Antechamber warfront, the Hellbugs return, a unicorn celebration and Summerfest are all in the cards! * Doubled the number of wardrobe slots you can have- the max is now a whopping 39! * Unstable Artifacts now count towards the completion of the guild quest "Digging Deep". * Player created chat channels will have join announcements enabled by default until 20 players join, and then it will shut off automatically. You may re-enable this manually if you so desire! * Your quest window now has room for twice as many quest items! * Fixed a bug where you couldn't use the friend dialog UI to summon a friend on a different shard if you have 'Friend to All'. * The collected book "Our Aelfwar Benefactors" can now be read properly. * Added new custom portrait frames! * The LFG system no longer slaps a deserter debuff on one random player in a group that jumps from one half completed LFG dungeon instance into a new one. * Fixed a case where the nameplate cast bar of a boss may show an incorrect interruptible color for spells they are casting. * Dying to find out where she got that mount? When inspecting another player, you can now mouse over an inspected item and Ctrl+F to find that item in the Store! * You can now preview items in the Loyalty Window of the Rift Store by control-clicking on the icons! * Announcers are now available for purchase! Select your favorite announcer on the PVP stats screen once you're in a warfront. * Mage Tank items now exist in vendor armor and weapon shops! * The Mystery Box: Dimensional Wonders is now available for sale. It is an improved version of the Dimension Item Mystery Box, with over 200 more items. * Times of Day are now available on the Store! They change the time of day in your dimension. * Want to track your achievement progress with ease? No problem! Tracked achievements now show up in both the achievement UI and in Quest stickies. * Added a search bar to the achievement window. * Linked achievements now show time of completion. * Several crafting UI improvements have been implemented! * Your recipe categories will be collapsed by default, but will now also remember which categories you had open or closed during your play session. * Added options to expand all, or collapse all categories. * Also added an option to hide all trivial (grey) recipes. * The macro UI has seen a revamp! * Players can now drag & drop their macros. - See more commands displayed in the command list. - Go through a tutorial if they're new to macros. * You can now preview dye in your character sheet! The character sheet will display icons of what items you are previewing. * Fixed a bug causing visual issues when previewing items and mounts with special effects. * Added more Color Blind options for customizing many UI text colors. Find them in Options>Interface>Colors! * A new edit text field has been added to your bank vault window that allows you to rename your bank vaults. * Raid frames now take priority when displaying debuff icons that are cleansable or cast by you. * Right-clicking on a player in your friend's list will no longer select the friend below the one you clicked on. * The upgrade UI tooltip rollover now compares against the item you are wearing. * Artifact rollover tooltips now more clearly show if you are able to collect the artifact or not. * Improved the World Event UI to include a shortcut button to any relevant achievements. * When you track any World Event quest, the starting location will now display on your map. * Zone Event: Exuvia of Khargroth: The loot tables in the event have been changed to only drop Storm Legion level loot thanks to a bug report by Nevian@Faeblight. * A Rift in Kelthenas Basin has been fixed thanks to a bug report by Krisinata@Deepwood. * Fixed several unmineable veins thanks to a bug report by Glodxius@Deepwood! * An artifact in Fen Gorge Bunker has been fixed thanks to a bug report by Laetitia@Laethys! * * Fixed quest items not dropping from rifts during the Fires of Rebirth and Ithkus' Rise zone events. * Quest: A Chancel Encounter: Can once again be turned in properly by players that have previously completed the Air Saga. * Colonel Lojaleco has been moved to be in a less conflicting area, thanks to Eldo@Faeblight! * The quest flow in Scarlet Gorge has received a smoothing pass. All kill quests have been converted to Carnage quests. * Quest: A Bit of Subterfuge: This Defiant quest will no longer get stuck in an in-completable state. * Porticulums have been added to the Defiant and Guardian hubs at Rock Ridge and to the top of Riverfell! 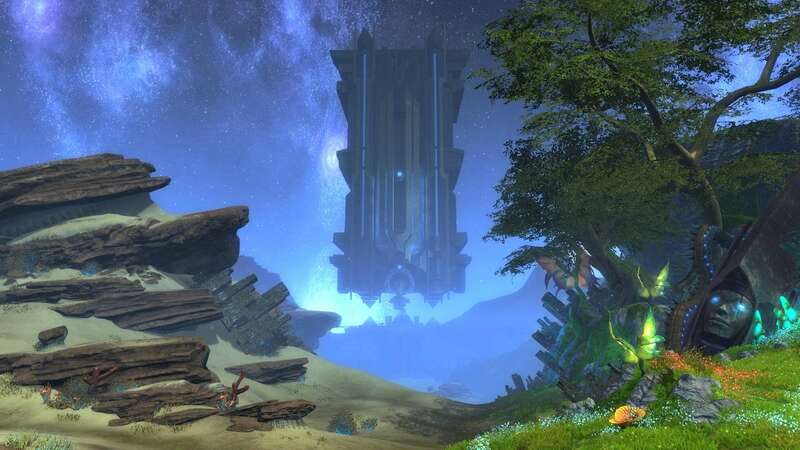 * An artifact in Steppes of Infinity has been moved so that it's attainable thanks to a bug report by Xathis@Deepwood. * A resource node in Dendrome has been fixed thanks to a bug report by Xylene@Faeblight. * Abandoning one of the weekly quests for the Dendrome world bosses will now only remove a single Mysterious Talisman, rather than all 3. * Interrupts can now affect both spells and melee abilities. * Presets: Fixed a typo in the Holy Fire Shaman preset description. * Presets: Updated the Ritualist and Soul Harvester talent presets due to the changes to the Cabalist soul. * Due to the extensive nature of this rework, please scroll down to the next post, which has nothing but Cabalist details! * Pursuit of Truth: Now more reliably applies to abilities after role changes. * Absolution: Now on the same shared cooldown as the other Cleric combat resurrection abilities. - Now deals Life damage over 15s, and reduces the Hit chance of the enemy by 5%. - Removed the damage variance. - Spreads to up to 10 enemies if hit by the Cleric's Hammer of Faith. - Increased the thread modifier to 3, up from 1. - Now has a 30m range. * Confidence: Now grants a Conviction every 6/3s. - Overhealing received from Doctrines now generates an absorb shield equal to 2/4/6% of the Cleric's Maximum Health. - Can occur up to once every 10 seconds. - Causes Doctrine of Bliss and Doctrine of Loyalty to consume up to 1/2/3 additional Conviction on cast, increasing the healing by 100% for each additional Conviction. * Doctrine of Authority: Increased threat multiplier on the damaging portion of this ability to 3, up from 2. * Doctrine of Glory: No longer consumes a stack of the damage bonus from Total Assurance. - Now hits 360 degrees instead of a frontal cone. - Now hits up to 10 enemies. - Increased threat multiplier to 3, up from 2. - Now deals its damage instantly, with no travel time. - Now deals its damage instantly, with no travel time or bounces between enemies. - Increased threat multiplier to 4, up from 2. - New 32 point root ability. - Shields the ally, intercepting 50% of the damage they receive, and replacing the ally's Toughness with the Cleric's, for 6s. - An ally can only be affected by a tank soul damage intercept up to once every 2 minutes. - Activated when Hammer of Duty or Hammer of Faith is cast. - Applies a buff to the caster increasing their Life damage by 2% for each Conviction consumed by the Hammer. - Now reduces threat generation by 50%. - Increases damage and healing done by 5%. - Causes casting Hammer of Duty or Hammer of Faith to apply a buff to the Cleric for 15s, increasing their damage by 2% for each Conviction consumed by the Hammer. - No longer causes overhealing to generate threat. - No longer reduces the values of self only absorbs. - Now increases threat by 400%, up from 350%. * Precept of Refuge: Increased damage. * Reprieve: Reduced the threat multiplier to 1, down from 2. * Righteous Imperative: No longer affected by the global cooldown. * Righteous Mandate: No longer affected by the global cooldown. * Salvation: The healing from this ability no longer generates threat. * Total Assurance: The buff now affects the next 2 Conviction consuming abilities used, regardless of how many Convictions those abilities use. * Curative Waters: Updated the ability description to help indicate that the AE cleanse is centered around the targeted ally and not the caster. - Now modified by talents that affect area effect healing. - No longer modified by talents that only affect single target healing. * Planar Attunement: PVP: Rune Shield now functions as a flat 25% damage reduction instead of absorbing 25% damage. It now only works in PVP. * Illuminate: No longer starts auto attack when cast. * Lifegiving Veil: Updated the ability and buff descriptions to indicate it prevents healing from other Veils. * Lifebound Veil: Updated the ability and buff descriptions to indicate it prevents healing from other Veils. - Now in tier 8 of the soul tree. - 30 Charge ability cost. - Now debilitates up to 10 enemies within 7m of the initial target for up to 5s. - Now Debuffs the initial target for 15s, interrupting them each second. - The ability description now shows correct info about the snare portion of the ability. - Fixed an issue causing conflicts with how this ability works with diminishing returns in PVP, and it should now function as expected. * Gathering Spirits: Now reduces the cooldown of Haunting Pain by 5/10/15s in addition to its previous function. * Malevolent Bolt: Increased damage. - Now reapplies itself to the enemy if it is cleansed. - Increased the amount healing absorbed. - Now increases the Mage's damage by 15%. - Now reduces the cooldown of Arresting Presence by 10s. - When damaged by a single target ability, drains 3 Power, Energy or Mana equal to 3% of the Mage's Max Mana from the attacker. - Lasts 1h and counts as a Mage Armor. * Priest's Lament: The ability description now includes the duration of the debuff. * Swift Control: The procs from this ability now only reduce the cast time of Mage abilities. * Thunder Blast: No longer affected by the global cooldown. * Eldritch Armor: Procs from this ability now only reduce the cast time of Mage abilities. * Empyrean Ascension: Can no longer be purged. - Now increases damage done by 1/2/3/4/5%. - Reduces damage taken by 1/2/3/4/5%. * Wind Chill: Now a tier 2 talent. * Icy Vortex: Now a tier 4 talent. * Opportunity: Now only affects Mage abilities. * Vitality: Now increases Endurance instead of Max Health. * Strike Back: Can now critically hit. * Shadow Distortion: New ability. - Increases the threat generated by damaging abilities based on the Rogue's endurance. - 40 point root ability. - Charge an ally and intercept 50% of the damage they receive for 6s. - This is a 32 point root ability. * Choking Gas Bomb: Now applies a blocker buff to players it hits, preventing them from being hit by Choking Gas Bomb again for 15s. * Divine Edict: New ability. - Increases the threat generated by damaging abilities based on the Warrior's endurance. * Thread the Trees: Now removes movement debuffs when used. * Blade of the Ascended: Fixed an issue causing Blade of Elemental Affinity to have a 100% chance to proc. Is now correctly 25% base chance and augmented normally by Elemental Flux. * Charged Pulse: Now has a 3s buff it applies to the caster to enable use of Double Pulse. * Double Pulse: Can now be cast while the Warrior has the Charged Pulse buff on them, instead of requiring that Charged Pulse be the previously cast ability. * Void Presence: New ability. * Into the Breach: Now removes movement debuffs when used. * Battlefield Experience: No longer affects Into the Breach. * Forced March: Is now off the Global Cooldown Timer. * Mage Tanking gear can be found in Expert Dungeons! * Laethys: Updated the encounter so that Silver Slagwalkers spawn near the Greed Elemental. Additionally, they no longer have a damage reflect shield. * The resurrect timer window can now be moved around the screen, and it's position will be remembered the next time it displays. * If you complete the meta-achievement Conqueror: Bindings of Blood, you'll receive the key to the new Charmer's Caldera dimension! - It contains one Eth temple, its courtyard, and a pool of deadly lava. - This means it our only dimension that can kill without PVP dimension items! * We've improved the Dimension Item Mystery Box; the new version is sold under the name Mystery Box: Dimensional Wonders. - The box has over 200 more items in it, about 90 of which are completely new and cannot be acquired in any other way. - Awesome new items include the Mossy Tavern, Animated Dendrome Wall, and Scaffold Elevator! - The only items removed from the box are the dragon floats, which you can still buy separately with Carnival currency. - There are 24 of these items, one for each hour of the day. - They are sold in kits in the RIFT Store. Find them under Dimensions>Interactive>Tools checkbox. You can also rarely acquire them from the Mystery Box: Dimensional Wonders. - When you place a Time of Day in your dimension, it sets and fixes the dimension's time of day to that time. - The Fine Print: Times of Day won't change the lighting or sky in those dimensions where the lighting and sky does not normally change throughout the day. - Adding another Time of Day replaces the effect of any earlier ones placed, much like how the music boxes work. * All players should now be able to achieve these fishing achievements: Pierless Angler, Ultimate Dusken Angler, and Ultimate Brevanic Angler. * Recipes for endurance runes for 2-handed weapons are now available on the RIFT Store and Runecrafter recipe vendor. * Storm Legion costume armor is now tintable. * Reinforced Ascended's Large Grips now has primary/secondary dye options. * The Doctor's Coat now has the appropriate appearance for Dwarf folk. * The End of Hope now drops more frequently. * Fixed the upgrade path for Empyreal Vanquisher's Fortified Brooch, thanks to qUiXui on the forums! * Several of the tanking weapons from Raid Tier 3 will now proc more frequently. * Some armor pieces from Greenscale and Akylios have received more desirable stats. With this update of the Cabalist, we're introducing a new type of ability we refer to as a Contextual Ability. These abilities have multiple functions that change as conditions change, and are most obvious when mousing over them in the soul tree or in your ability binder, as they will show multiple tooltips. In the case of the Cabalist update, Obliteration abilities change based on which Obliteration buff you have active, or even if you have no Obliteration buff at all. The tooltips for these abilities in your hotbar will always tell you what the ability will do if you were to cast it at that exact moment. With these abilities and buffs, the Cabalist is now able to use their Obliteration buffs to help tune their damage based on how many enemies are present and if they would like to focus on a single enemy or multiple enemies, all while using the same rotation for each situation. * Resets the cooldown on all Sigils. * Causes the next 4 Sigils to have no cooldown, but does not affect Sigil of Catastrophe. * Has a 1m cooldown, does not count down until the buff has been consumed. * 41 point branch ability. * Increases damage done by 3%. * Increases all resistances by 3%. * Greatly increases the damage of Obliteration abilities and causes them to deal single target damage. * Shares a cooldown with Condensed Obliteration and Unbounded Obliteration. * 36 point root ability. * Increases damage done with area effect abilities by 3%. * Increases the damage of Obliteration abilities and causes them to affect up to 5 targets. * Shares a cooldown with Focused Obliteration and Unbounded Obliteration. * Shares a cooldown with Condensed Obliteration and Focused Obliteration. * From here on out, Focused Obliteration, Condensed Obliteration, and Unbounded Obliteration will be referred to as FO, CO, or UO, respectively. * When an Obliteration buff is active, they affect the below abilities in different ways. * FO: Deals Death damage. * CO: Deals Death damage, split equally between up to 5 enemies. Total damage is increased by 60% for each additional enemy hit. * UO or none: Deals Death damage to up to 8 enemies. * FO: Applies Curse of Anarchy. Deals Death damage over 15s. * CO: Applies Curse of Anarchy to up to 5 enemies. Deals Death damage over 15s. Total damage is increased by 80% for each additional enemy affected. * UO or none: Applies Curse of Anarchy for 15s to up to 8 enemies. Deals Death damage to up to 3 enemies every 1.5s. * Can only affect 1 enemy. * FO: Deals Death damage over 15s. * CO: Applies Curse of Solitude for 15s. Deals Death damage to up to 5 enemies every 1.5s. * UO or none: Applies Curse of Solitude for 15s. Deals Death damage to up to 8 enemies every 1.5s. * Triggers Tyranny of Death. * CO: Deals Death damage, split equally among up to 5 enemies. Total damage is increased by 60% for each additional enemy hit. * UO or no Obliteration buff: Deals Death damage up to 8 enemies. * FO: Deals Death damage. Restores 15% health and mana to the Cleric. * CO: Deals Death damage to up to 5 enemies. Restores 6% health and mana to the Cleric for each enemy hit. * UO or none: Deals Death damage to up to 8 enemies. Restores 4% health and mana to the Cleric for each enemy hit. * Triggers early if the enemy dies or is damaged by the Cleric's Tyranny of Death. * FO: Deals Death damage after 10s. * CO: Deals Death damage to up to 3 enemies after 10s. Total damage is increased by 80% for each additional enemy hit. * UO or none: Deals Death damage to up to 8 enemies after 10s. * Now causes Cabalist curses to place a debuff on the initial target of the curse. * This increases the damage taken from the Cleric by 2/4/6/8/10%. * Now also reduces the mana cost of Shadow's Touch by 5/10/15/20/25%. * Now affects the next 3 Sigils, down from 4. * No longer causes Darkness stacks to increase damage from Shadow's Touch. * Now gives your Curses a 20/40/60/80/100% chance to apply all known Curses when cast. * No longer on the global cooldown. * Now affects up to 8 enemies in PVE. * Now affects up to 5 enemies in PVP. * Now grants Stealth while stationary. * Restores 2.5% health each second. * Resets the cooldown of Dark Passage. * Now applies a blocker buff to players it hits, preventing them from being hit by Sigil of Secrecy again for 15s. * Now increases the damage of Shadow's Touch by 30%. * Causes Shadow's Touch to apply a stack of Darkness, dealing Death damage over 15s. * Causes Curses to deal additional damage based on Spell Power when they expire, or 300% of this damage if the Curse is cleansed. * Max of 3 stacks. * Now triggers Tyranny of Death. * Now an instant cast ability instead of a channel. * Now based around the initial target's location instead of a PBAOE. * The debuff is now applied at the time of cast, effecting up to 7 enemies within the Well of Souls. * Now applies a 15s debuff. * No longer has a cooldown. * Only one instance of Well of Souls can be active at a time.